The texture of the chopped onions and tomatoes you see in the pictures is dude to chopping them finely in the chopper attachment of my hand blender . I find it very useful for quick meals and chopping the vegetables one by one as you go on adding them to the pan is so very convenient . I guess many of you do the same . 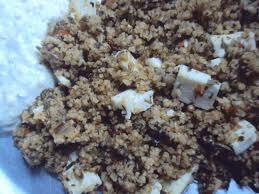 In this recipe such minced chopping works best as it brings the best flavors as the daliya soaks them well. Soak the daliya in 3/4 cup of water as you chop the vegetables. Heat the ghee in a pan and throw in all the whole spices and let them splutter a bit. 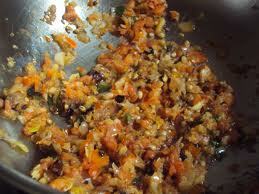 Add the chopped / minced green chillies , ginger n garlic and let them stir fry till the sizzle but now browned. 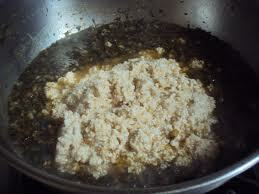 Add the chopped onions and sprinkle some salt as it will help frying the onions in low fat medium. Fry the onions till they sweat and turn pinkish. Add the tomatoes and fry till the tomatoes wilt too. Now it is time to add the dill greens , mix everything well , add salt pepper and cumin powder . Add red chilly powder too if using. mix well. 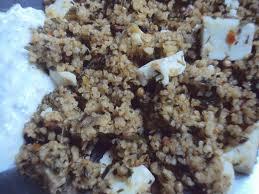 As the dill greens wilt and sizzle , add a cup of water , the paneer cubes and let it boil . As the green mixture boils , add the soaked daliya to it . Mix well and cover to cook for 5-7 minutes on low flame . Check when the daliya looks fluffed up and cooked . It cooks really fast and just needs to absorb all the flavors from the spiced up vegetables....sprinkle the kassori methi , mix well and let it stand covered for 5 minutes before serving. Serve hot with plain curds or raita . If you don't get dill greens (soya bhaji) , fresh or dried fenugreek leaves are also good for this with a finishing of fresh coriander leaves . 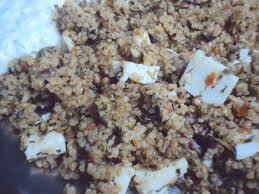 daliya recipes for diabetics healthy meals high fiber these foods helped me loose wt. Very healthy recipe.. looks gr8 ! !